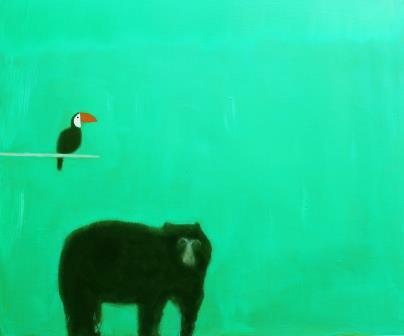 An auction of Andrew Squire’s painting ‘Spectacled Bear’ will take place in Wimbledon on Sunday 21 September 2014. All proceeds will go to support the conservation work of World Land Trust (WLT). Andrew is a longstanding supporter of WLT and it was his idea to auction a painting to raise funds and awareness of the Trust and its work. This is not the first time that Andrew has helped raise funds for WLT. In April 2011, he donated 10 per cent of sales of works at an exhibition Hinterland at Thompson’s Gallery London. 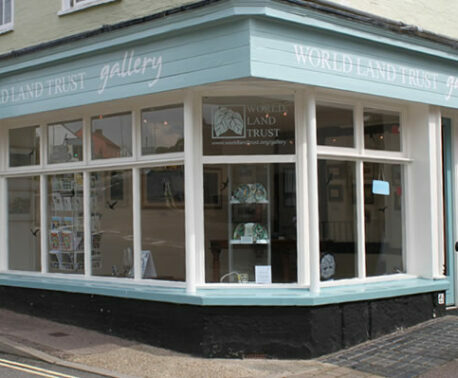 In 2012, WLT gallery in Halesworth displayed a selection of Andrew’s bird paintings in an exhibition curated by Judy Stafford of Stafford Gallery. The painting will be auctioned at 1pm on Sunday 21 September. The auction is being hosted by Stafford Gallery in association with Wimbledon Fine Art. The work, pictured above, is 24 x 20 inches, oil on board. 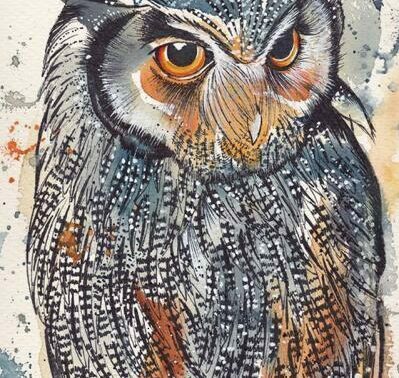 The retail price of the painting is £2,400 and the bidding will open at £1,500. Those unable to attend the auction can send bids to Judy Stafford by email (judy@staffordgallery.co.uk). Please use the subject line Andrew Squire auction for WLT and provide a name, address, telephone number and email address. Bids can also be made by phone (020 8944 6593 or 07939 048 436). If leaving a phone bid, please make sure to leave a name, address and contact telephone number. The current bid will be published on the Stafford Gallery website. The auction is one of a series of events taking place this year to mark WLT’s 25th Anniversary. Other anniversary events include: A Musical Flight, Bill Oddie and Sarah Class in performance at Birdfair on 16 August 2014; Controversial Conservation 2014 with Chris Packham on 2 September 2014; David Gower & Friends on 3 September; and Nick Baker’s Weird Creatures on 24 October 2014.